Couple of years back, I started growing Italian basil. There is a local variety that's good for flavour but I somehow always missed the lighter hued, crisper Italian basil that holds much better in recipes. It grew rather well. Every once in a month I could gather enough basil for a jarful of pesto and I treasured it more than saffron. I added it to pretty much everything for a day or two. Pesto paratha? Yes. Pesto curry? Yes, been there. But of all things, we savoured a sprouted wheat berry salad with coriander basil pesto and cherry tomatoes and it became a regular at dinners. And then, I stopped making it. Well that and I got pregnant, I travelled, then I travelled more and my basil plant died. Amongst the new responsibilities of being a mother, getting meals ready for my family and just trying hard to be good at everything, I forgot all about my balcony herbs. Last month, I got a new basil plant. Last month, I decided I wanted to blog again with a new revived approach. To just let myself be. I'm pushing my self to be more organised, planned and work harder, thanks to my daughter who has been teaching me all of that. In retrospect, this salad is my way of getting back into grove of things. The wheat berry is replaced by quinoa which I mentioned I have been loving lately and has a lot more greens. It is a texture and flavour galore which I promise you will love! It's not just greens thrown in for the sake of health or pretty. 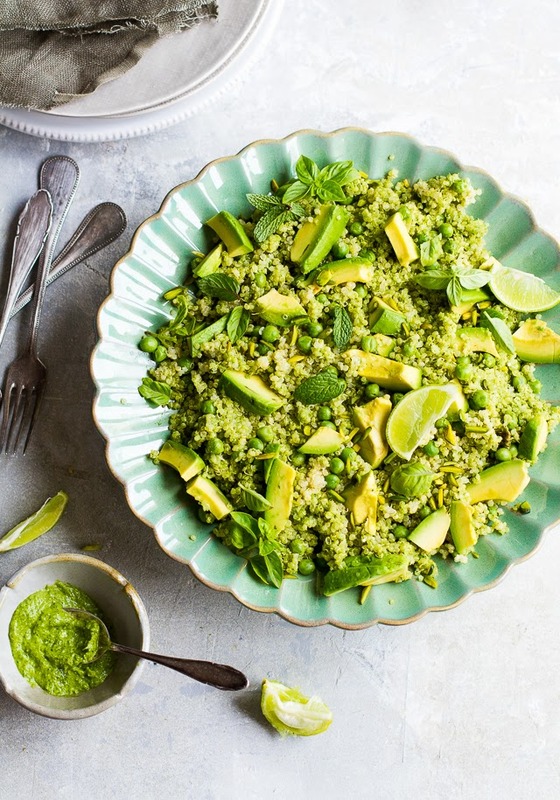 The sweet fresh peas, creamy avocado, vibrant crunch of pistachios, a bit of chilli kick from coriander basil pesto and zesty lime are all in one salad bowl, no wonder it is christened Green Goddess! A great addition to this salad would be asparagus (picked that up from a salad I had at GIA). With some grilled chicken (garlic flavoured works best) this is a complete meal. 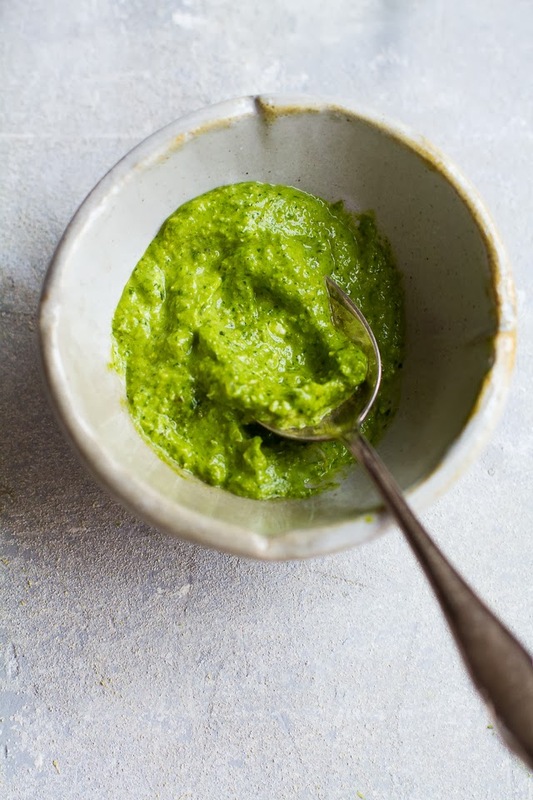 Blend the ingredients for pesto in a processor and keep aside. 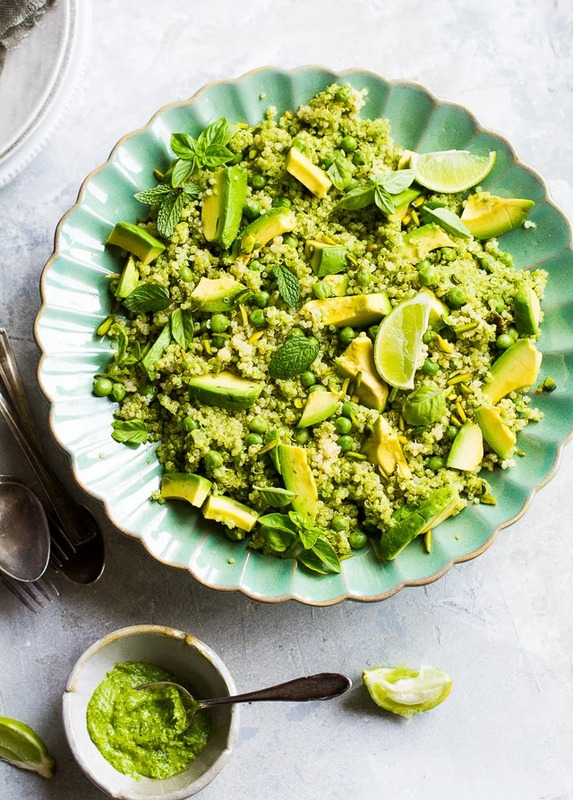 Boil the quinoa and let it cool. 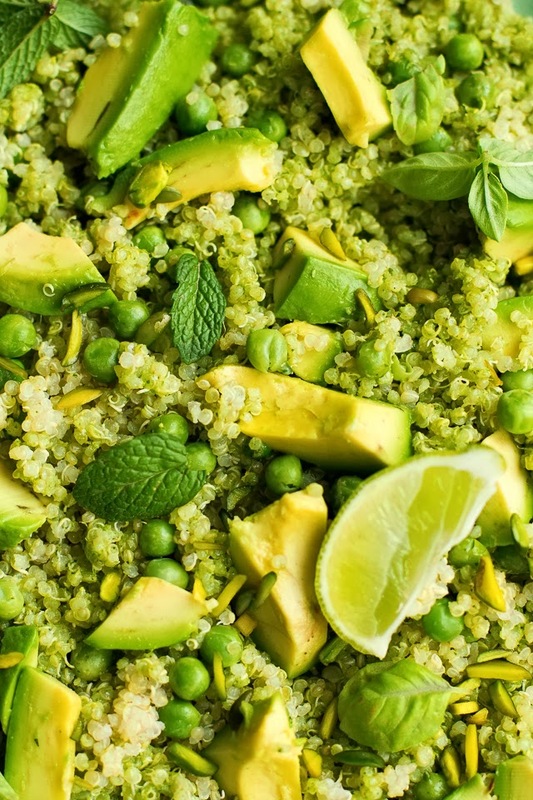 Mix the peas, avocado, quinoa, lime juice and pesto. 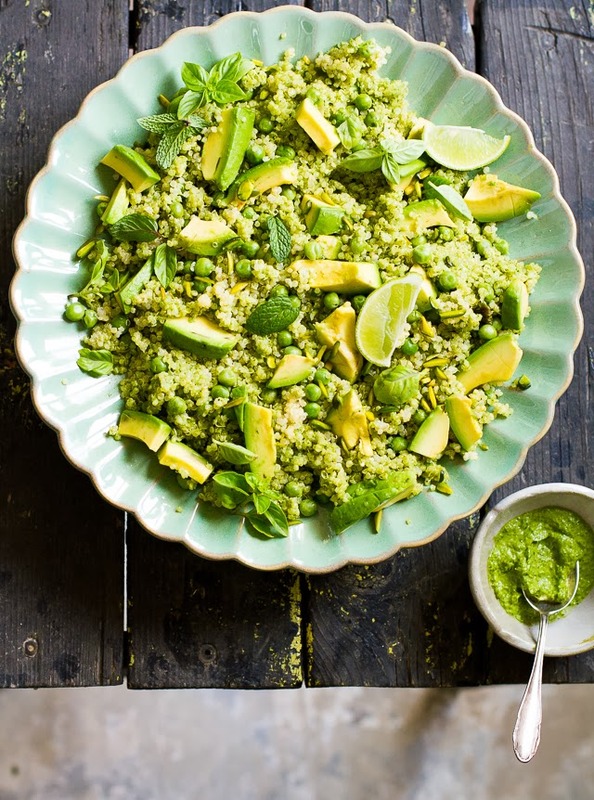 Sprinkle with pistachios, fresh mint and basil. A beautiful salad! Delightfully green and deliciously healthy. Mmm so much green!! This salad looks freaking awesome! What a beautiful salad. It's interesting what things bring about retrospect. Nice post. so true, thank you for reading. I love this gorgeous salad Kulsum! And I'm so glad to read you'll be blogging more frequently. I've missed your photography and your gorgeous posts. Here's to beautiful green salads! I used to grow a lot but then suddenly I stopped a year back. Got too busy with A. I want to start replanting this spring - at least a few basic herbs by the kitchen window. Totally loving the pistachios here and that serving dish - want! I have some tomatoes too! What a beautiful plate of green! ooooooh I am really digging this recipe! Great name --- I love all green recipes! 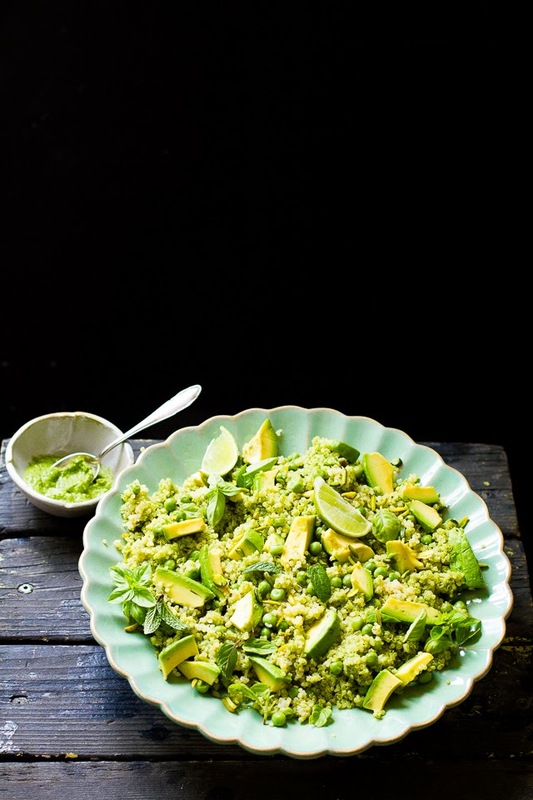 This looks and sounds so gorgeous, but what can I substitute for cilantro, which I hate? Thanks for suggestions. Chrigid, just use all basil instead. I wouldn't use any other herb as it might not work with rest of the flavours. Let me know how it goes :)! What can I substitute for the cilantro? Cannot find fresh coriander leaves anywhere - can you suggest a subsitutue? Excited to make try this for dinner tonight! Why isn't there a button to make it printer friendly? Or did I miss something? I made this for a green-themed party last night. Mine did not have the lovely light green color that your pictures show, but it was delicious. Vegans and omnivores alike commented on how good it was. Thanks for the recipe! So glad you enjoyed it. Thank you.